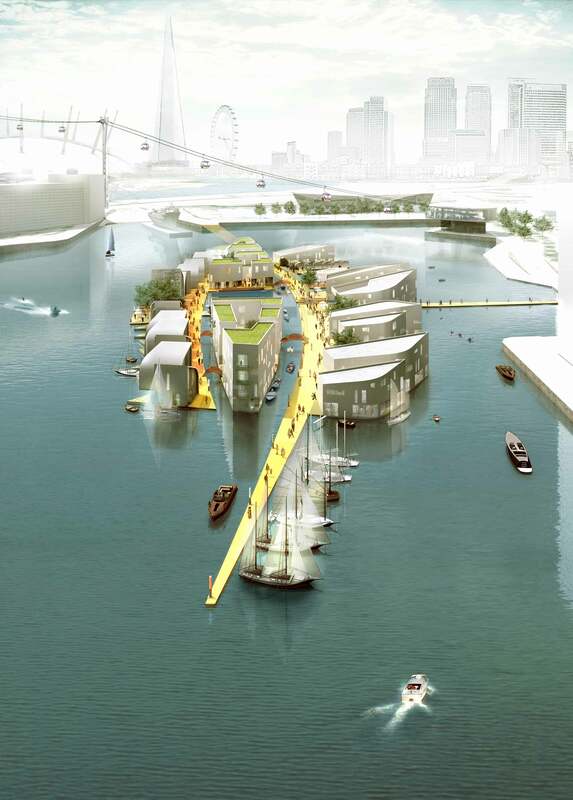 Baca Architects have come runner up in an ambitious plan to build a floating village in London’s Royal Docks, as part of the Mayor of London’s Vision. The team, led by Hadley Mace, developed plans for a floating village conceived as a ‘Crown’ in the Royal Docks. It would form; the head of a future necklace of floating settlements that could extend throughout the Docks along a watery ‘Champs Elysee’ boulevard. A fundamental approach to Baca’s plan was that the development should not be an extension of the dock edge. Rather that it should be set away from the dock edge and surrounded by a ‘blue belt’, to provide space to breathe and express the unique ‘aquatecture’. The village design has the bold ambition of the original dock builders and would be innovative, inspirational, iconic: a legacy that future generations could be proud of. Designed and built in Britain the HM team’s approach was to make a uniquely British floating village, both bold and playful. Their floating village design contains all of the components one would expect of a quintessential British village but on water; small local stores, a village hall/gallery, and even a floating village pub set on the edge of the village blue. The floating village is conceived as a ‘Crown’ in the Royal Docks. Built within the waterspace but set away from the dock edge the Crown is a coherent development yet extendable to form a necklace of floating settlements throughout the Dock. It will truly come to life during carnivals, regattas, races and day to day with visitors in row boats and pedalos meandering through its watery lanes. This iconic, innovative and inspirational design will create a unique destination, raising London’s waterfront profile high on the world stage. The Crown contains many facilities of a typical village (store, hall, pub) expect they are all floating. It is surrounded by water and organised around the World’s first ‘Village Blue’, just as a village settlement is an island within the countryside, surrounding a green. It is planned along water lanes, rather than roads. The proposal is supported by a ‘waterspace plan’ similar to the one developed for the Liverpool South Docks, partly within the World Heritage Site. The design aims to be iconic, innovative and inspirational. It has a bold masterplan yet enables growth through densification and extension. The architecture has a coherent language but will involve other architect to add variety. The whole village will come to life during carnival and regatta days or Sunday afternoons when the docks will fill with boats, like the Jubilee. The design of the Crown has been considered to enable events to occur within the village, around the Corniche as well as within the main body of the dock. During summer months and for major events the floating village expands to cater for more visitors. This is similar to a fair arriving in the village green. In winter months the leisure pontoons can be rearranged to consolidate the village and provide wind breaks. The Village Blue is surrounded by a lively mix of uses, including restaurants, shops, offices, the hotel, the pub and homes. These buildings will all be delivered through the pilot. The office/retail space is also designed to allow for conversion to retail, restaurants or a gallery as the village may grow. ‘Plug in’ temporary uses could increase the use and activity in the summer time or for special events, while still preserving a feeling of openness. Paving is interspersed by planting, creating buffers between buildings, windbreaks and views over water. A variety of trees including flowering cherries will provide seasonal variety of colour and texture enhanced by reflections in the water. Floating gardens provide additional amenity to the floating villas and habitat. The hard landscaping is colourful and playful like an exotic promenade, clearly identifying the walkways / edges against the water.